When it comes to software updates for Android smartphones, Sony is going the best so far. In the past few months, Sony has been leaving all other manufacturers far behind in terms of Android software updates for its Xperia series. Sony has been rolling out updates, one after another and sometimes the users just get confused which one is the latest firmware and which one they should flash on their device, confusion with the firmware region is another thing that might occur. Since the firmware updates are rolled out through OTA or through Sony PC Companion, they take much time to hit different regions. Some regions receive the updates instantly while some receive the updates after long delay and this is something the Xperia enthusiast who are always willing to get the latest and greatest version of Android on their device, might not be able to tolerate. Users can also receive an update by changing the CDA of their device, but that can be done by going a little out of the way, and things should be kept as simple as possible. Updating your Xperia device manually is the best choice if the update isn’t hitting your region and you are not seeing it coming your way anytime soon. If you’re going to flash the Generic firmware on your device, you don’t actually need to worry about the region as well as the region-specific firmware comes with some bloatware that you can probably remove from your device, but you need to be careful with flashing a carrier branded firmware on your device. Flashing the firmware manually is possible through flashing a Flashtool Firmware File using Sony Flashtool. Although there’s a number of people who post FTFs for different Sony Xperia Devices on the XDA developers forum as soon as a new update arrives, and there’s a number of some sites as well who post the FTF files, but you might just fail sometimes locating an FTF file of your choice for your Xperia device. 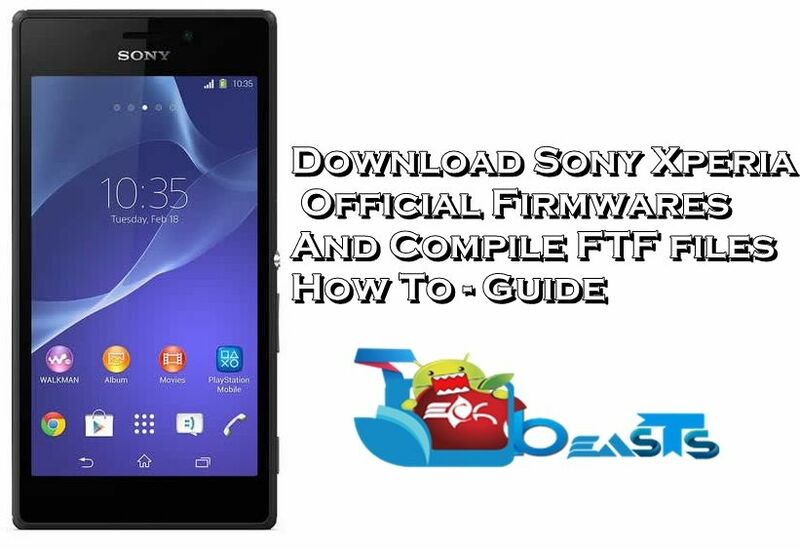 In this case what you can do is, you can download the stock firmware from Sony’s server, create your very own FTF file and flash it on your device. Before you start wondering how you can download the firmware from Sony’s servers, you may not be aware of Xperifirm, a great little application by XDA Senior Member LaguCool. Xperifirm allows the Xperia device users to check the updates in all the available regions and shows the build number as well. You can simply choose your desired firmware and download the FILESETs and then compile the FTFs in order to flash. Downloading the firmware and compiling up the FTF might seem a difficult job, but it won’t be difficult anymore once you scroll down. In the succeeding guide, we are going have a look at a comprehensive method that will help you to create the FTFs files successfully once you have downloaded the FILESETs for your desired firmware. Let’s start it now. First of all, you need to know what’s the latest firmware for your device. You can always check the latest build number on Sony’s official site. Run XperiFirm application file now, the one with the black favicon. Once XperiFirm opens up, you will see a list of devices. Click on your device’s, select the model number carefully. Once the device is selected, you will see the firmware and their details in the next boxes. Now see what build number matches the latest build number, and what region do you want to download it from. A firmware with the operator name like “Customized IN or Customized US” is a generic firmware, that means this firmware has no carrier limits of carrier boundaries. While other firmware will be carrier branded. Make sure that you choose the firmware properly, do not download a Customized firmware on a Carrier Branded device and do not download a Carrier Branded firmware for an open device. Once you have selected your desired firmware, double-click on it and in the third column within the same window, you will find your firmware’s build number. Click on and it will popup with the download option. Click on download button and select the path where you want to save the FILESETs and let it download. Once downloaded, head towards the next part where we will be compiling up the FTF file. In the recent updates, Xperfirm has stopped creating the FILESETs. It downloads the bundles now and extracts them into your selected folder. Instead of converting FILESETs now, you will simply push the files of firmware into the Flashtool and create an FTF file. Here’s how this will be done now. After downloading the firmware files, open Sony Mobile Flasher Flashtool. In the Flashtool, click on Tools > Bundles > Bundler. In Bundler, select the folder where you downloaded the firmware. Sony Flashtool will show you the files from your firmware folder on the left side now. Select all the files except all .ta files e.g. simlock.ta, fota-reset.ta, and cust-reset.ta and all other such files. Also, drop the fwinfo.xml file if there is one. Click on “Create” and it will start creating the FTF. It will take some time to create the FTF file. Once the FTF is ready, it will appear in Flashtool > Firmware folder. You can share the FTF with your buddies as well now. When you download a firmware, a “Manual” mode appears on the download box. The Manual mode is self-explanatory. If the method given above doesn’t work for you, you can get a guide for that particular manual mode using the Manual button on the downloader of Xperifirm. Download and install Sony Flashtool on your PC. Now in Flashtool, click on Tools > Bundles > FILESET Decrypt. A small window will open up. Now in the source, select the folder where you downloaded the FILESETs using XperiFrim. Once you select the source folder, the FILESETs will be listed in the “Available” box. These FILESETs should be 4 or 5. Now select all FILESETs and push them into the “Files To Convert” box. Now click on “Convert” and conversion will begin. It will take 5 – 10 minutes for the conversion to get completed. As soon as the FILESET Decryption ends, a new window “Bundler” will open up that will allow you to create the FTF file. If this doesn’t open up or you just close it accidentally, you can still access it by going to Flashtool > Tools > Bundles > Create and select the source folder where you downloaded and decrypted FILESETs. Now select the click on the empty bar in front of the device from the device selector, enter firmware region/operator and enter firmware build number. Push all the files to Firmware Content except .ta files and fwinfo.xml file. Sit back and wait for the FTF creation to finish. Once done, you can find your FTF in the installation directory > Flashtool > Firmwares. You can flash the firmware using our Sony Flashtool guide. And, You will also get a torrent file for the FTF. You may share it with others over the web.